Keen cooks and foragers have been encouraged to pick their own wild garlic at Prior Park Landscape Garden during the past two weeks. 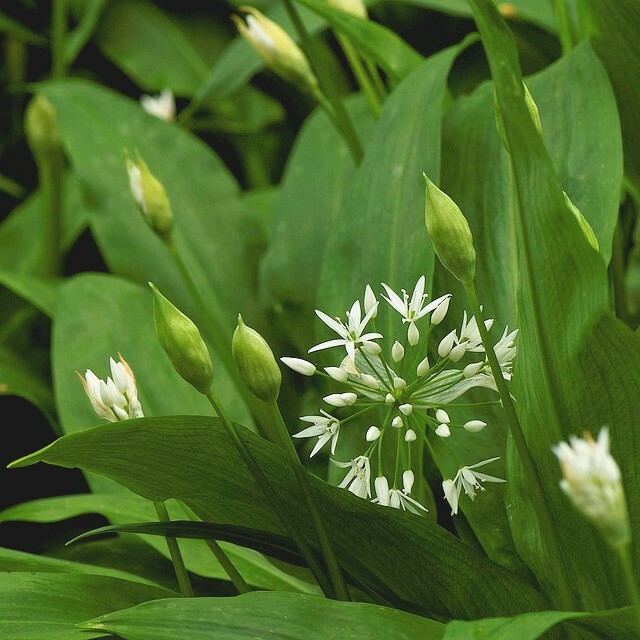 Visitors have been encouraged to take to the woodland paths, through the swathes of the white flowers from the wild garlic, while the pungent odour washes through the air. Simi, from Simi’s Kitchen, a local baker, preserve maker and cookery teacher uses fruit, vegetables and herbs she has grown or picked in Bath. Here is a video of Simi out foraging and cooking beside the lakes during the fortnight wild garlic festival. We Spring into Grass Cutting Season! It is finally that time of year…where the gentle hum of the mower drifts across the airwaves. A much later start this year, but it will continue to grow long and green for the forseeable future! The garden is looking fresh, vibrant and ready to recieve many spring time visitors! The Snakes Head Fritillaries look stunning in the Summerhouse Glade, contrasted by the subtle yellow of the Daff’s. Let’s hope for many more sunshine filled day throughout the month. Troughs can definitely be a nuisance when they go wrong, as the Skyline crew found out over the past few weeks. From trying to find the Stopcock (i.e. the tap) in some mystic corner of a field to cleaning what seemed like mountains of mud out of them, our volunteers have without a doubt got trough maintenance down to a ‘T’. 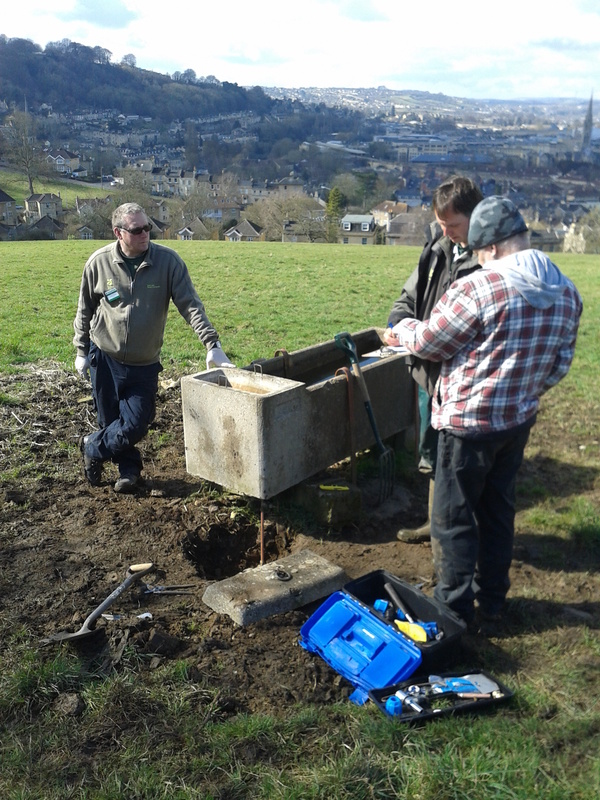 Luckily, our lovely maintenance manager, Paul was on hand to help as was the Ranger from Dyrham Park, John. 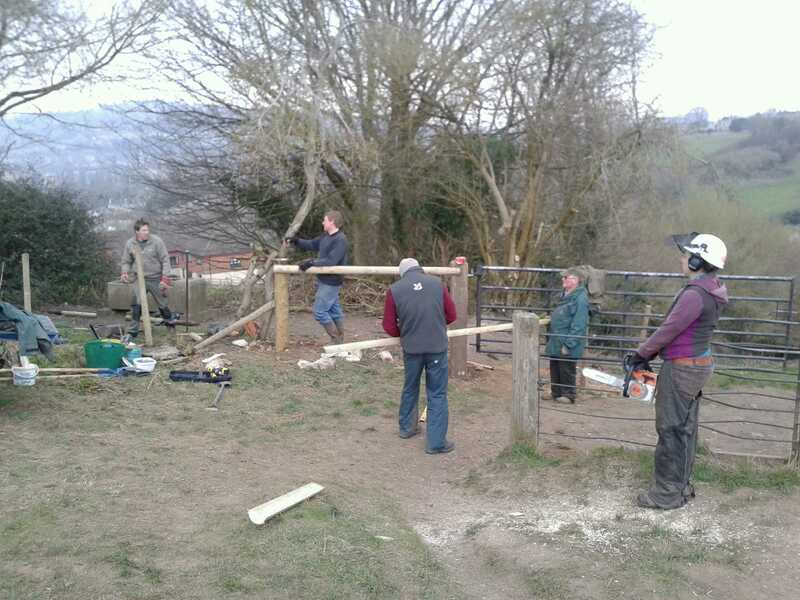 As well as troughs, last week we got to work with one of our local farmers, Jonathan Meredith on repairing a fence at the bottom of Smallcombe Vale. The day was spent cattle proofing the fence with some wooden rails just so the cows wouldn’t get too adventurous! Fence building with the team. And for those of you who were interested in the mystery space down at Prior Park back in August. It’s finished! Take a peek below at the new locker room, complete with heaters and a sink! This week was all about Easter eggs. All week the Skyline team were painting and decorating some egg-shaped blocks of wood, which were kindly cut up by Ranger Rob Holden. 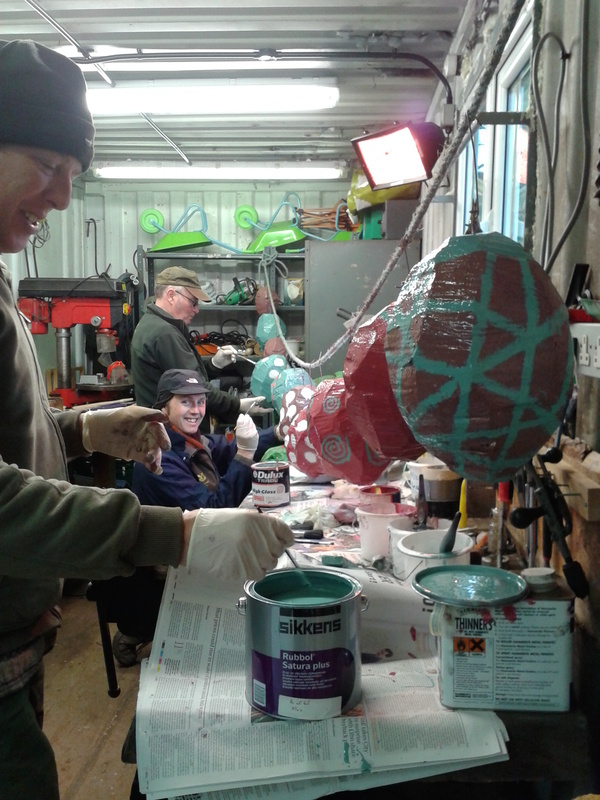 These ‘eggs’ were then covered in a white base coat before being decorated by the artistic minds of the volunteers. That being said, I’m sure there is more paint on them then there are on the eggs! On Thursday, these masterpieces were hidden among the trees for all of you lot to find for Easter. As well as these, there is an extra special egg waiting to be found when you arrive at the quarry mid-way through the wood. 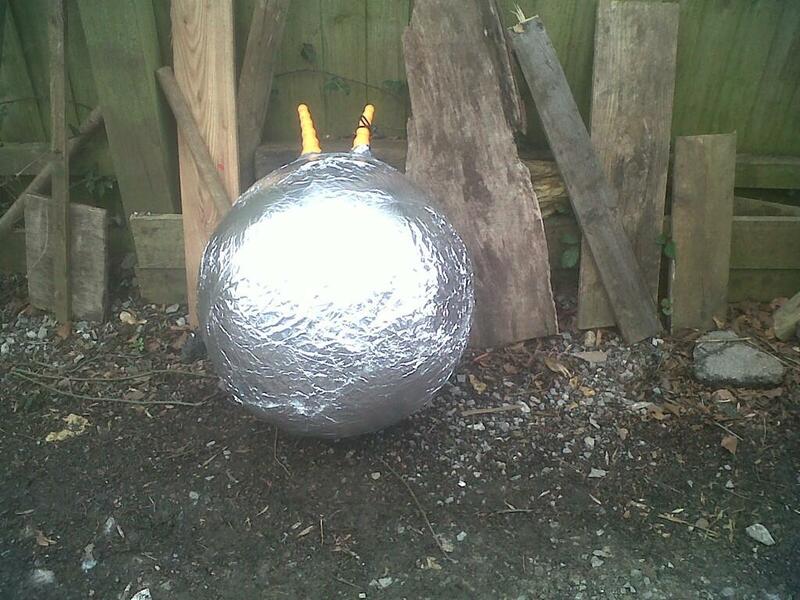 The assembly process for this definitely had us in giggles! Remember to go look out for them over Easter, starting Monday 25th through to April 7th. I’m sure you will have as much fun looking for them as we did making them! So after this week, I think it’s safe to say that Bath has experienced pretty much all the seasons in the space of 4 days. Freezing cold gales and rain one day to hot summer sunshine the next. We even had some flurries of snow and sleet on Wednesday! Hard to believe it’s actually March, isn’t it? 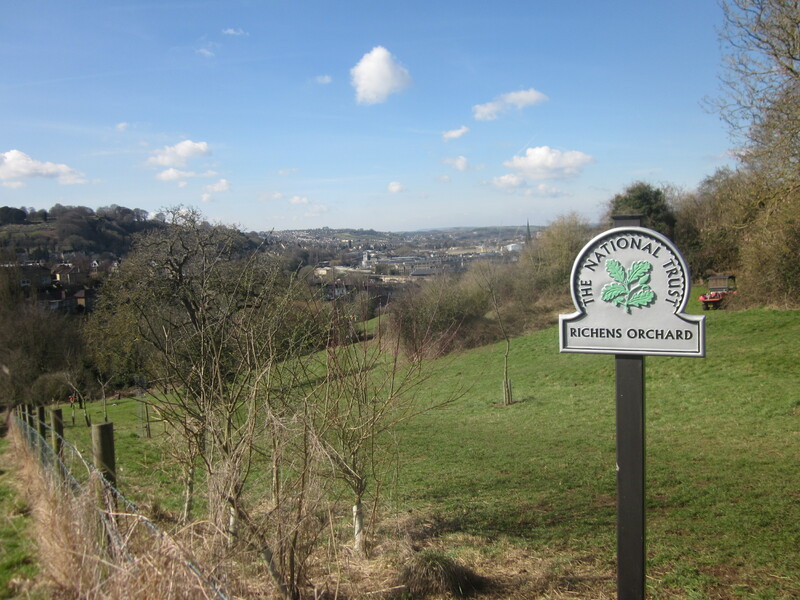 Well despite this crazy weather, the team up at the Skyline were out making the best of the hotter days by having a group session down in Richens Orchard (at the bottom of Bathwick fields). The day was spent mainly raking, as the grass had been mowed earlier in the week to keep it from becoming overgrown. 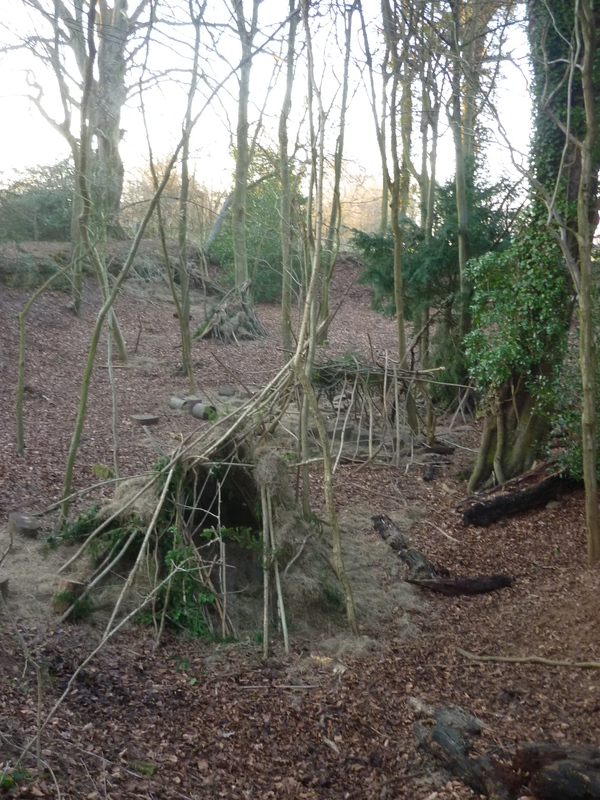 The remaining few hours were spent removing an old fence and creating habitat piles and log piles in the neighbouring wood. I’m sure we made some small invertebrates very happy! With the 4 Skyline volunteers and 2 additional Richens Orchard volunteers (and a lovely blonde Lab named Barley! 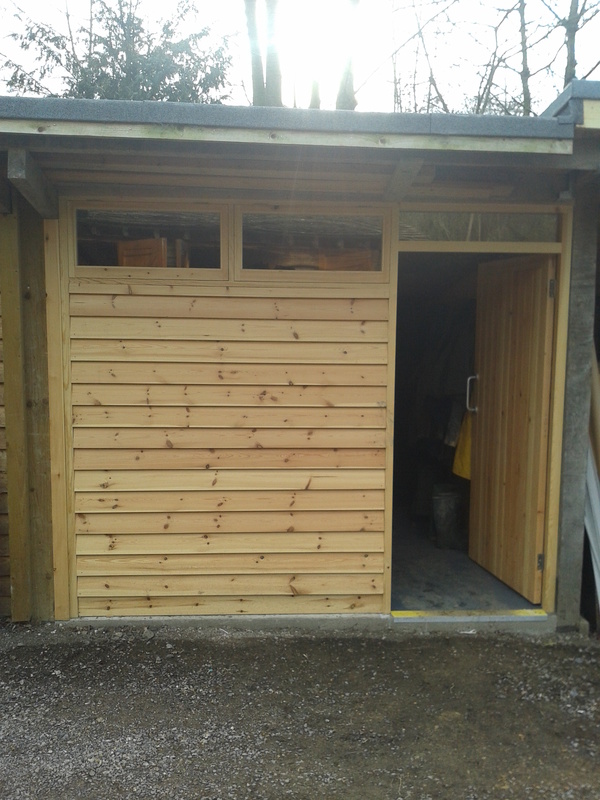 ), it became a great day with a lot of work done. Hopefully we can have more days like this, especially the sun! 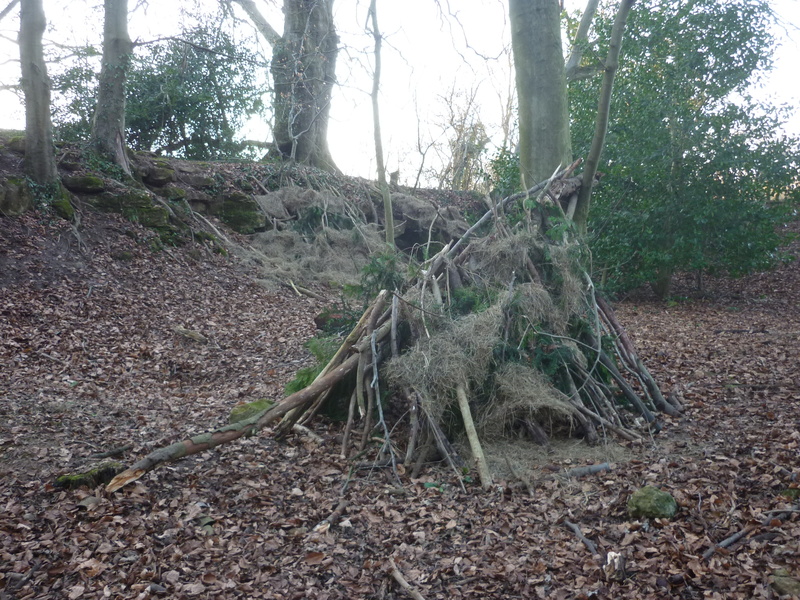 The week of half-term meant the people of Bath could celebrate, and the Rangers at Bath Skyline were more than happy to help by hosting an excellent day building dens over in Larch Wood. 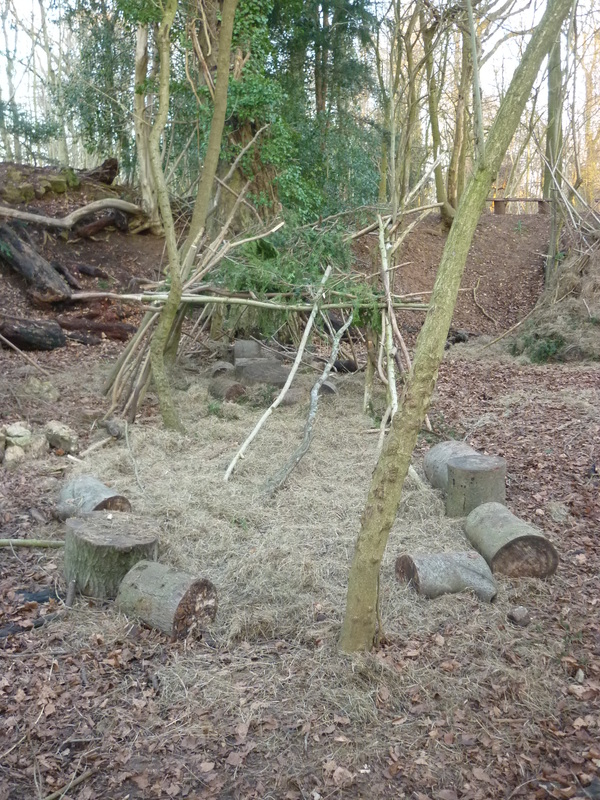 Camped out in a small quarry, members of the public came with their children and enjoyed a day of making a variety of lovely dens out of branches, trees, logs, leaves and hay. 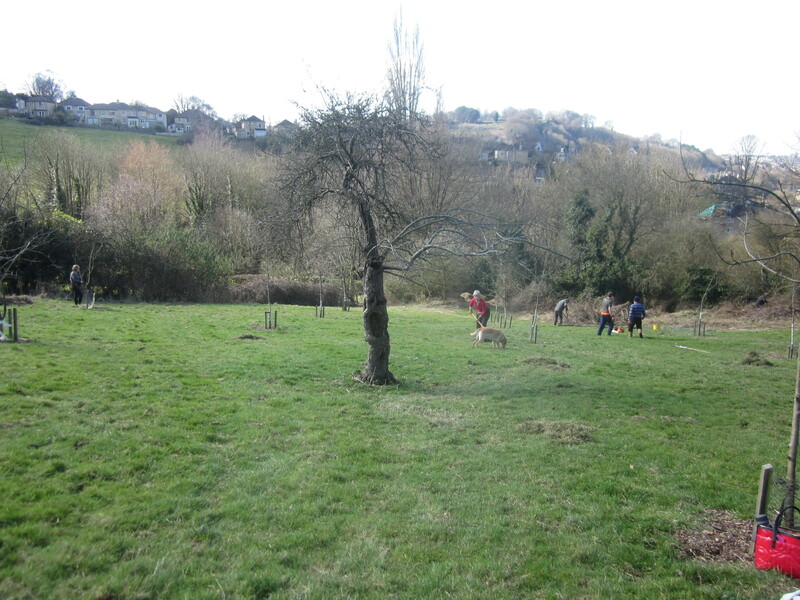 From giant structures with log furniture to lean-to’s thatched with hay; the kids of Bath busied themselves becoming budding builders with the help of their friends, family and, of course, the overly excitable National Trust volunteers! 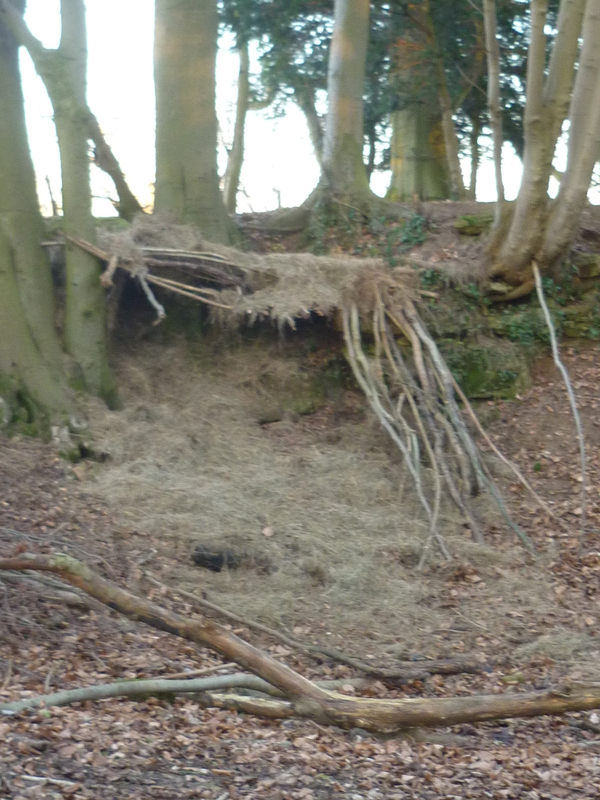 If you do happen to be walking that way anytime soon, do check these amazing dens out for yourself. Trust me, you won’t be disappointed! So the New Year has been and gone, and as you all know our cherished Jim has left Prior Park for his, no doubt, exciting retirement, and of course, we wish him all the best! Now even though he is not here anymore to continue this wonderful blog, the staff here at Prior Park and the Bath Skyline have ganged together once more to continue his fine handy work. Hopefully we can do him justice and keep all of you lovely readers updated and entertained on the behind the scenes action here at Bath National Trust. Yes,I know that I’ve been neglecting you these pase few weeks, no excuses, just couldn’t think of anything to write. Still it is now getting very near Christmas and once again it’s pouring down out there. But the garden is still maintaining it’s charm despite large puddles and muddy grass. 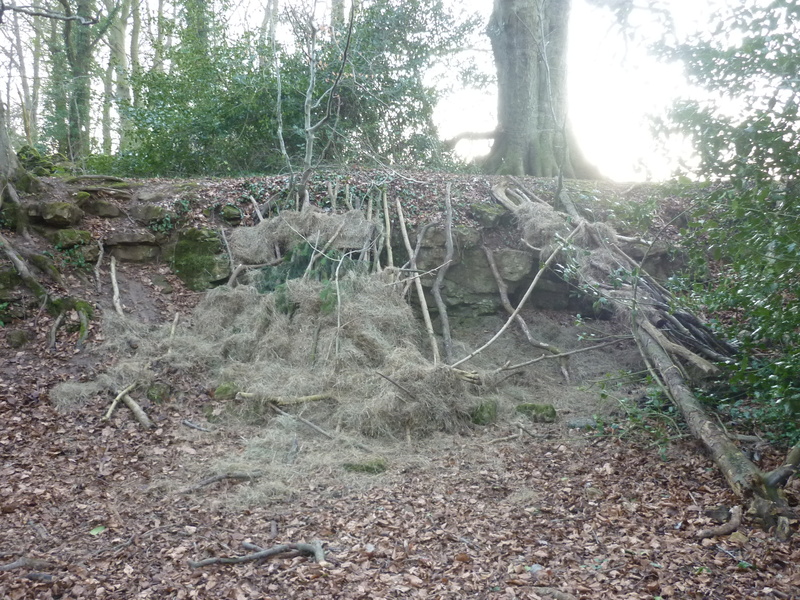 We have been busy trying to repair some of the leaks in the bottom dam, so far it looks like we have succeeded. Elsewhere we have continued to move leaves, fill holes, lay new path surfaces, saw up and split wood, prune overgrown shrubs and just generally garden. But as we are coming to the end of the year I have decided it’s time to leave and take retirement. I have been associated with Prior Park for the past 18 years and have enjoyed just about every minute of it, even the rain! It has been a privilege and joy working in such a beautiful place and I will miss it, as well as the staff and volunteers, friends, that I have worked with. Hopefully someone will continue with this blog, perhaps someone with a better grasp of English than me, you can only hope. 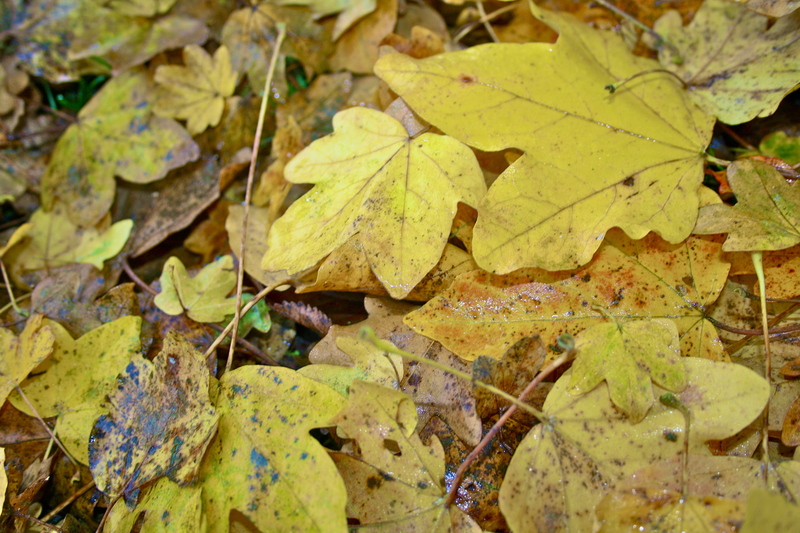 The park is now in its full autumn glory of red and gold with the Field Maples displaying a fantastic vibrant yellow. However, the leaves are beginning to fall and the Friday volunteers have been busy with the leaf blowers clearing a carpet of leaves from the paths ready for a busy weekend of visitors. Come and enjoy the colourful garden before the trees are bare! 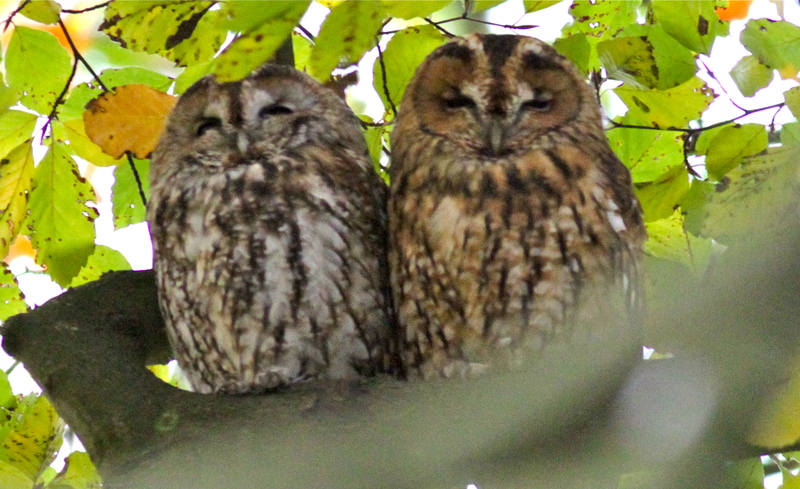 Just a quick update on our Tawny Owls. They are still roosting in one of our large Beech trees and seem fairly content and fairly aware of what is going on around them as you can see. If anyone can tell me why they are slightly different colours I would be grateful.